Uys and his handful of crew members drove about 50 000 km in 4x4s to film The Gods Must Be Crazy. 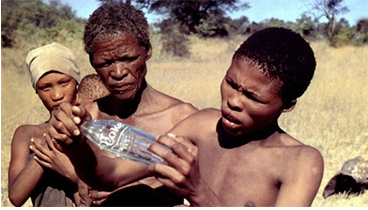 Synopsis: The peaceful co-existence of a small Bushman community is destroyed when a Coke bottle falls from the sky. They have never seen as strange an object and think it a gift from the gods. In their community they have no sense of ownership, they share and share alike, but now, individuals want to possess this wonderful thing and problems previously unknown, start. Why did the gods send only one? It is decided that N!Xau will travel to the end of the world and return the bottle to the gods by tossing it over the edge. So starts a journey that will lead to many strange and eventful adventures. By 1980 Jamie Uys was one of only a handful full-time film-makers in South Africa. His last three pictures each set records, surely Uys could not do it again? Whilst making "Dirkie" and "Beautiful People" he had become intrigued by the serene and wise so-called Bushmen. “A name I haven’t got yet. It’s about a white and a Bushman and will take place in Botswana...” and “It’s a bit of everything – comedy, pathos, tension…” a secretive Uys divulged. Uys first spoke about his Bushman-Coke movie-idea and his fascination with these enigmatic desert people in 1976. A pure documentary about the Khoi San, as was the case with Beautiful People’s red dunes, was too bland. He needed to intertwine documentary with entertainment. He returned to his cinematic genesis. Uys would use the essence of his first picture, "Daar Doer In Die Bosveld" (Deep In The Bushveld). From there other themes sprang up. “There are only 13 000 Bushmen left in the country and I saw as many as I could find,” said Uys, who went on the hunt for his ideal desert hunter. Uys drove and flew tens of thousands of kilometres searching for his undiscovered leading man. “[T]hey live over a vast area...and they don’t have addresses,” the film-maker described. “I took 50-60 photos of prospects, marking the longitude and latitude where they were located.” Back in Johannesburg Uys had to pick one from hundreds. A lot (including a budget of millions) rode on his choice. “When I looked at the photos, one stood out” Uys had said, “There is a word adeldom in Afrikaans that describes him exactly. It’s sort of aristocracy…though that sounds too pompous.” Having found his star and his core storylines, Uys needed something to tie it all together; something so ordinary that everyone will recognize it. “I simply used a Coke bottle because it is such a recognizable form,” Uys spoke of his cinematic eureka moment. 1981: Switzerland’s Festival International du Film de Comedie pour: Grand Prix: The Gods Must Be Crazy. 1981: Norwegian Film Festival: Grand Prix: Voted the most popular movie by the jury and press and the public. 1981: London Film Festival: Outstanding Film of the Year: The Gods Must Be Crazy. 1982: France’s Chamrousse Grand Prix: The Gods Must Be Crazy. 1984: Film Advisory Board: Award of Excellence: The Gods Must Be Crazy. 1984: Southern California’s Motion Picture Council: Golden Halo Award of Special Merit: The Gods Must Be Crazy. 1984: Southern California’s Psychotherapy Affiliation / Screening Guild: Courage in Filmmaking Award: The Gods Must Be Crazy. 1984: Nominee: Cèsar Award for Best Foreign Film, directed by Jamie Uys. 1985: The Academy of Science Fiction and Horror Films: Golden Scroll: The Gods Must Be Crazy. 1985: The Academy of Family Films and Family Television: Award of Merit: The Gods Must Be Crazy. 2000: Yahoo! : The Gods Must Be Crazy: Nominated by Americans as 7th best foreign film – ever. The Gods Must Be Crazy regularly becomes the victim of copycats - as is the case with many international box office hits. Since its release in 1980, numerous imitations have been made all over the world with very silly things dropping from the heavens into some very silly stories. However, there are only two movies in the franchise: The Gods Must Be Crazy I and The Gods Must Be Crazy II. So, it doesn’t matter what the gods are doing in the title, if it doesn’t say it was directed by Jamie Uys and produced by Boet Troskie for Mimosa Films, then it IS an ungodly fake!